Missions are unique to each person and are put together of a student’s memories, goals, and wants. By definition, a mission, also known as a short-term mission, is a Christian missionary for a short period of time ranging from days to a year (short-term Mission). Although there is a Google definition for mission trips, it doesn’t apply to everyone. Ashton Overby, a 15-year-old Christ-follower from Liberty North, talks about his unique experience within his mission trips. “We do one thing through our church called the Freedom Drama, which is kind of a big thing, it’s like a skit kind of. It’s like a story visualized and I always play Jesus and that’s kind of dope. It’s a picture of the gospel from creation to resurrection and those traditions in the places we go to in Greece and South America. They are very oral traditions where they share a lot of stories and those are very big to them. We also do a lot of English camps for refugees. We did a lot of day camps for a slump in Ecuador.” sophomore Ashton Overby said. Ashton used his strong personality to support and help the people and community in Ecuador. Google explains that missions are based around God and everything they do is meant for sharing the Gospel, but Ashton clearly has a bigger picture because he helped the community in other ways than just sharing the Gospel. A mission trip is special to each person based off of their love of God and the church community. Missions are special for students but can be a burden to afford. Missions trips are expensive but life changing to members of the church, such as Ashton. “They can be fairly expensive because, obviously, there are travel expenses and then taking care of food and what they are doing over there for the mission. One of the things we do as a church and as a family is we ask other people if they are willing to give. There are a lot of people who can’t go on a trip who are willing to give so someone else can go. A lot of the expenses are covered that way,” Ashton’s mother Randi Overby said. This is a special event for the people who didn’t get the opportunity to go. It is almost out of a movie to see a community come together and be willing to give their hard-earned money to support Ashton. I can only imagine how life changing it is and how it must feel to know that these people trust him to use their donation to the best he can. It says a lot about Ashton’s personality. He must be a very loved and have a unique personality. Alongside Ashton, the Overby family sends Ashton’s twin sister Abby, across the world to share their gospel and create life changing experiences. Typically, traveling across the world is a one-time thing, not for Ashton who started his missions when he was just 13 years old. Ashton tells us about all the places he has traveled for missions. “For missions, I have been to Texas, which is kind of its own country, and two other countries, Ecuador, which is in South America, and Greece, which is in Europe. 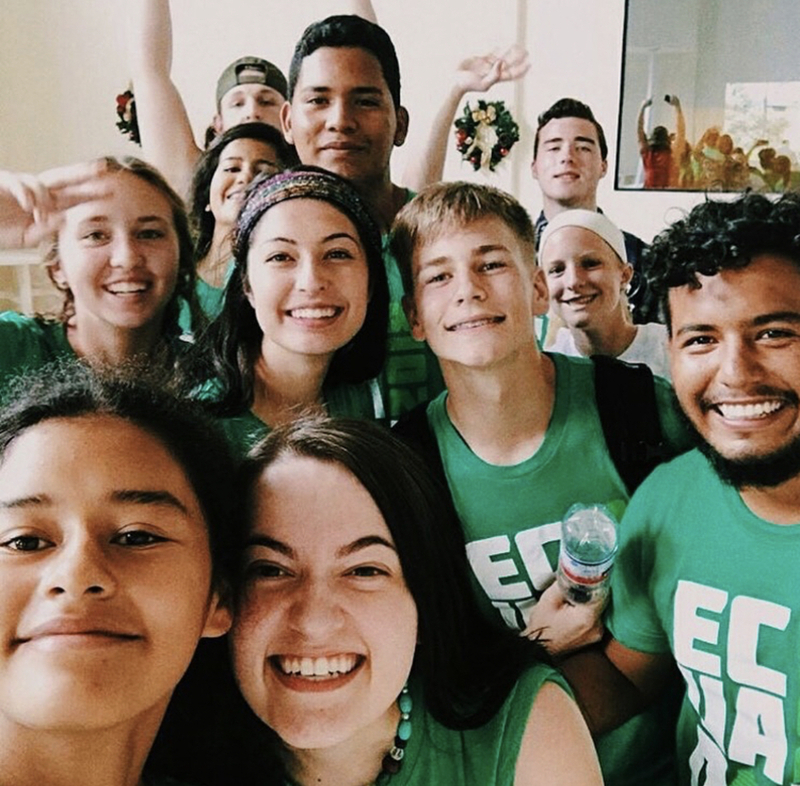 I just got put on a team last week and we are going to Ecuador again over spring break for 10 days and it’s going to be a group of 25 students and adults and we are going to go down there and do another kind of camp for a local slump we have been working with and do soccer and English and church camp.” Overby said. Ashton is a unique soul, he is willing to give his time to give someone love in a way that can be very time consuming. Although it may seem that Ashton’s passion for people is rare in society these days, his family is right there with him. Ashton has an older sister and a twin sister who also traveled hundreds of miles to serve. Abby Overby, Ashton’s twin sister, often travels with Ashton. When asked about traveling with Ashton she was happy to talk about their bond. “You already feel really good about doing it, so when you are with someone you are close to its cool. You know them and you get to see how they grow and you get to see how they serve so it’s just a cool thing to watch them.” sophomore Abby Overby said. Ashton and his twin Abby are very special and it is amazing to see their personalities shine. Although the money can be dragging, the family is happy to send these high-spirited twins across the world to share their strong personality. This whole family is part of something special and life changing. As mentioned, each mission is unique, but what brings them all together is the love brought through the religion. The missions aren’t for the people going. They might bring great memories, but that’s not the bigger picture. “Missions are never about us, but always about God” (Marchall, Morgan). It is human nature to put yourself first, not for Ashton though. Ashton tells us why he goes on these missions and how it affects him. “It has to do with a lot of my calling as a Christian. It’s made very clear in the Bible. The Great Commission calls us to go out to all nations, and to, help those in need and while doing so share with them the good news in Jesus. It’s really eye opening, because as Americans we are very individualistic and materialized. It’s very humbling to go out to those places where family is everything, community is everything, and just really helping them out and it changed a lot of their views on Americans too, so it’s really cool.” Overby said. This shows Ashton must have a very shining soul if he is able to change the perspective on Americans. America can be perceived as greedy but Ashton’s stories changes the outlook. It displays the great things Americans can accomplish by putting together our money as a community to send a helping hand across the world. It is special to see someone with so much passion for helping other people through what he knows. “It brings a lot of joy to my heart just to see how happy people get when you just do simple things, like just talking to them,” Overby said. Missions trips are expensive but life changing to members of the church such as Ashton. Randi Overby makes it known that you can go on expensive mission trips with outside help. It helps create a community and travel in a unique way. Abby Overby creates a feel for what’s it’s like to travel with her twin. Ashton makes it easy to see something special in the world. Ashton Overby, a 15-year-old with the most selfless and strong personality I have ever met.